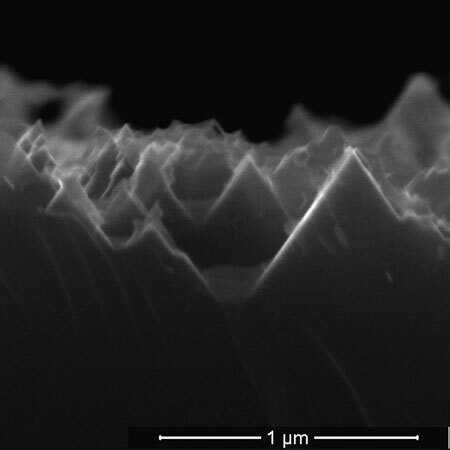 (Nanowerk News) Rice University scientists have found a way to simplify the manufacture of solar cells by using the top electrode as the catalyst that turns plain silicon into valuable black silicon. 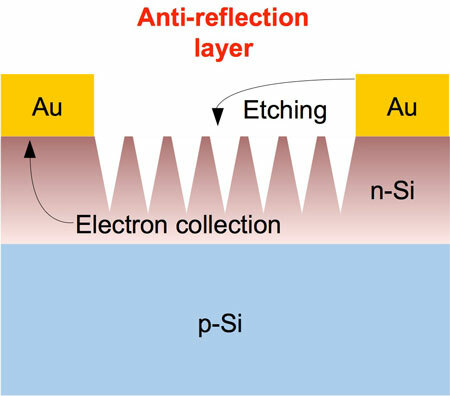 The Rice lab of chemist Andrew Barron disclosed the research in the American Chemical Society journal ACS Applied Materials and Interfaces ("In-situ fabrication of a self-aligned selective emitter silicon solar cell using the gold top contacts to facilitate the synthesis of a nanostructured black silicon anti-reflective layer instead of an external metal nanoparticle catalyst"). "Yen-Tien was doing the reaction with gold top contacts, adding silver or gold catalyst and getting these beautiful pictures," he said. "And I said, 'OK, fine. Now let's do it without the catalysts.' Suddenly, we got black silicon -- but it was etching only a certain distance away from the contact. And no matter what we did, there was always that distance.